We have seen that Richmond spends a lot more money per student than either the division average or its peer jurisdictions. For that extra money, Richmond gets vastly inferior performance; indeed it is in a race for lowest SOL pass rates in the state. 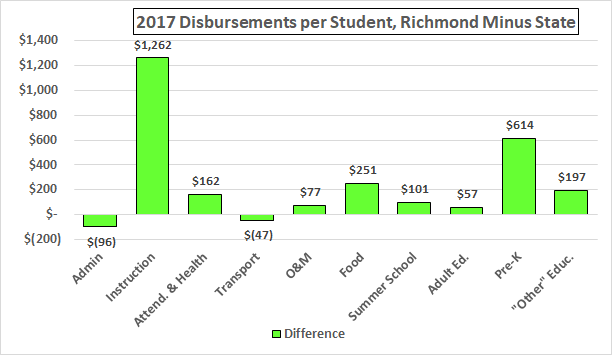 To begin examining those data in more detail, here are the 2017 disbursements (not including facilities, debt service, and reserves) per student for Richmond, the peers, and the division average (rounded to the nearest dollar). And here are the totals for just the day school operations. 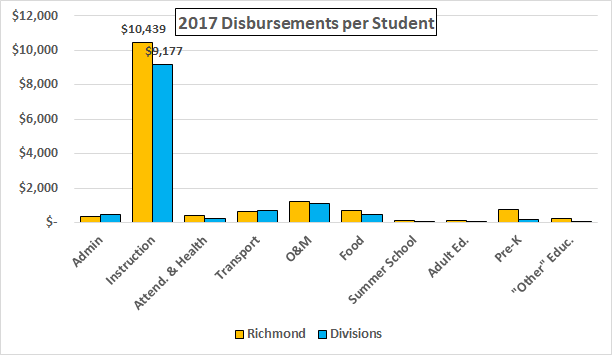 From these data, we can’t tell where those funds are going in the instruction category but we know that we aren’t getting any return for the money. The (very) large Pre-K expenditure (funded in some part by federal Head Start money) does not look to be producing results either, at least not in the overall sense. 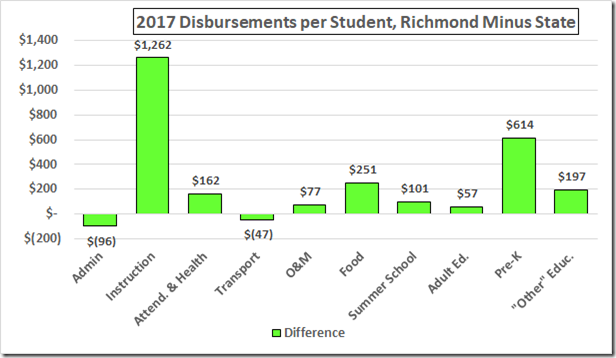 The food expenditure makes sense in light of Richmond’s relatively large proportion of free and reduced lunches (albeit the poverty rate in Richmond does not begin to explain the low pass rates). The state data don’t tell us where the “other” educational expenses are going. Richmond is grossly violating the state law that requires it to deal with truancy; their puny (and lawless) effort as to attendance cannot explain the relatively large expenditure for Attendance and Health. 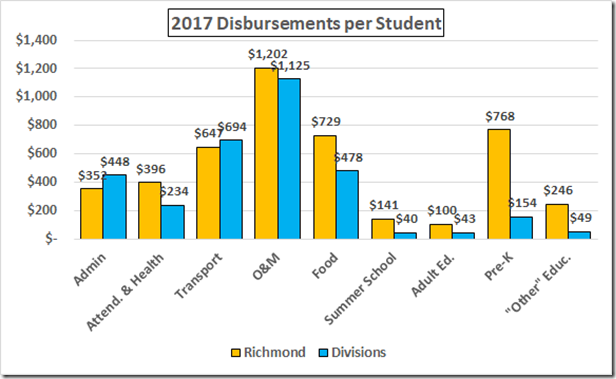 Our new Superintendent has asked the Council of the Great City Schools to audit the Richmond budget. Let’s hope that effort provides a more detailed – and more helpful – look at how our tax money is being squandered on these awful schools.